Thermal Comfort uses building science principles to provide customers with the most energy efficient, durable and mold free homes on the market. We recognize the importance of properly air sealing a home to guard against infiltration of air, moisture and pollutants. We prefer to take a “whole house” or “systems” approach to insulating. A change in one component of the system will affect other components in the system. 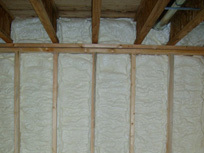 For example, insulating and air sealing a house will lead to a more energy efficient structure. However, thought must also be given as to how moisture will be expelled from the house now that the structure is tighter. In addition, our employees regularly attend continuing education courses to increase their knowledge in not only in the insulation field, but also building science in general. Having informed, educated installers provides a sense of security to our customers that the job is being done correctly.